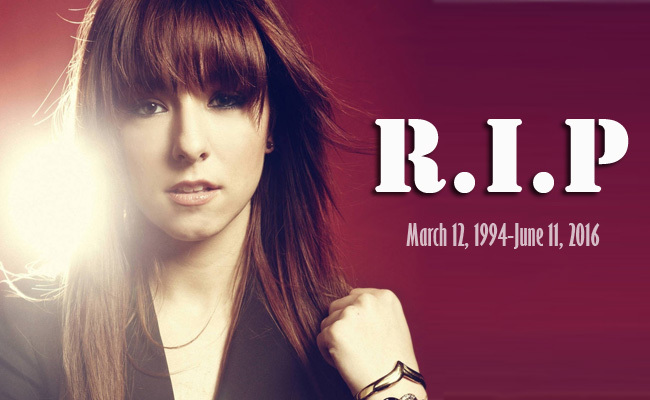 Many are shocked when the former contestant of The Voice Christina Grimmie died at the age of 22 yrs. old when a guy walked towards her and shot Christina at the backstage of her concert while signing autographs at Orlando’s Plaza Live Theater around 10:30 pm. Christina’s brother Mark Grimmie tried to approach the male suspect to don’t cause any chaos but the gunman shot himself and died. The Orlando Police told the media that Christina was in a critical condition when she was transported to the Orlando Regional Medical Center. Her fans were patiently waiting outside the venue hoping for their idol’s recovery. Around 2:45 am, her publicist confirmed that Christina passed way and is now with the Lord. She then asked respect for the privacy of Christina’s family and friends who are mourning this time. The Orlando Police also confirmed her death at their official twitter account. After the news broke out, many celebrities and her fans expressed their grief to Christina’s sudden death through their social media accounts. One of them is her former mentor at The Voice Adam Levine where he posted a photo of him and Christina on his instagram and wrote that he was sad and confused by her death. Other celebs also include Nick Jonas, Demi Lovato, Hailee Steinfeld and the band Before You Exit whom Christina performed with that night. Her fans first trended the #PrayForChristina when they learned that she was shot but it changed to #RIPChristina when it was confirmed that Christina passed away. Before Christina’s show at Orlando, she was inviting her fans on her twitter account to go at her concert. For those who don’t know, Christina finished at 3rd place at the finale of The Voice on it’s 6th season. After her stint at the show, she became popular on social media by her own versions of popular songs like Nelly’s “ I Have a Dream” where her youtube account zeldaxlove64 has a total of 17 million views.